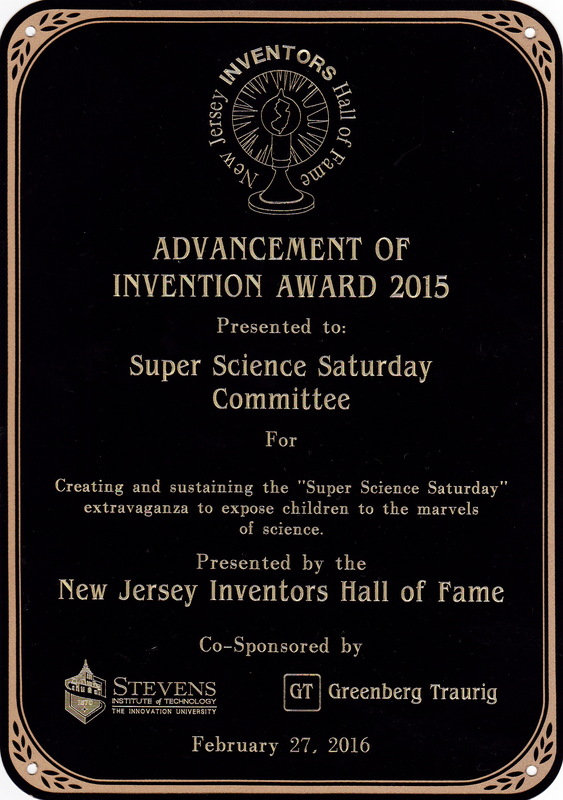 The volunteers and presenters who have made Super Science Saturday work for so many years have been involved not for any special recognition but because they love science and impacting kids' lives and working collaboratively with others. They come from not only Ridgewood, but the whole Bergen County area (and beyond). While we don't "toot our own horn" we thought some folks might be interested in more details about the NJIHoF Award. 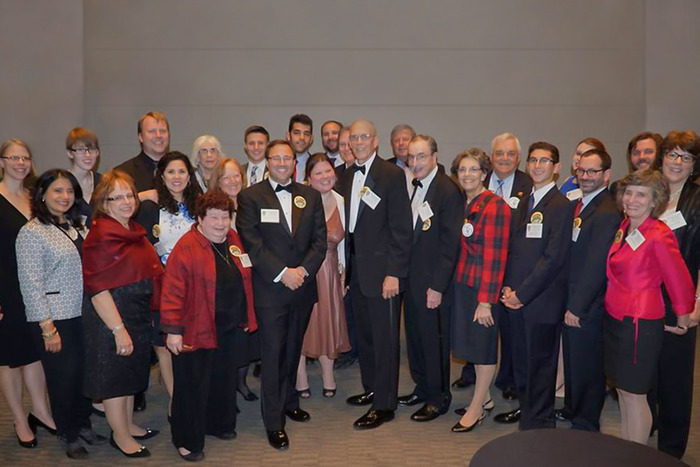 More importantly, it is a small way to recognize all those aforementioned volunteers and presenters, and maybe excite some of you reading this to join the Volunteer Committee. While the ADVANCEMENT OF INVENTION & PROCESS AWARD was presented to MichaelAaron Flicker and James Wallace for "Creat(ing) and sustain(ing) the 'Super Science Saturday' extravaganza to expose children to the marvels of science," past Volunteer Committee members were invited to the Awards dinner October 22, 2015 and stood for special recognition during the actual Award presentation. See the Group who came. The Plaque recognizing the Volunteer Committee at SSS #28, February 27, 2016 was modeled after those presented to Flicker and Wallace in October, as was a Citation honoring Volunteer Committee members, presenters, sponsors and helpful individuals. President Les Avery and other representatives of NJIHoF presented the Plaque, Citation and special commemorative button to presenters and volunteers during SSS #28. (See Original Citation, Governor Congratulations, and our Page from the October Awards diner program.) In addition, Jim Wallace has offered some Reflections as to what has possibly made SSS worthy of this recognition. Super Science Saturday has turned out to be a wonderful extravaganza, sustained by a unique convergence of design, volunteers and presenters. It's fun! It's engaging! Involvement is rewarding! Please join us: as an attendee, as a Presenter, and especially as part of our incredible Volunteer Committee.